Sports Direct is to review all agency worker terms and conditions after the firm was criticised for its employment practices. The review will be overseen by majority shareholder Mike Ashley, who also owns Newcastle United Football Club. The company defended itself against recent accusations about its employee practices, denying it "named and shamed" workers over a warehouse tannoy at its Shirebrook site. It also denied penalising ill staff. Earlier this month, the sports goods retailer admitted that it searched staff leaving its warehouses, but said it had reduced the amount of time these searches took. A report in the Guardian suggested the extra, unpaid time taken for "rigorous" compulsory searches meant workers were paid less than the minimum wage. The Guardian sent undercover reporters to work at Sports Direct's warehouse in Shirebrook in Derbyshire last month. Sports Direct said it employed a number of its Shirebrook staff through two agencies, which had both told the firm they did not use controversial zero-hours contracts. These are agreements that do not guarantee a minimum amount of work. In October, a BBC investigation found that ambulances or paramedic cars were called out to Shirebrook 76 times in two years. Many of the calls were for "life-threatening" illnesses. Former workers said some staff were "too scared" to take sick leave because they feared losing their jobs. 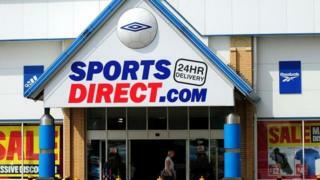 Sports Direct said it did not penalise its staff for being ill. It added: "Sanctions may be applied if workers fail to follow the company's reasonable sickness absence notification procedures, which are in line with industry best practice." Staff can ring a hotline if they wish to complain, with "no risk of reprisal". It did admit to using a "strike" system to warn workers of underperformance, but said it would review the practice. The Guardian reported six strikes in six months would mean a worker would be dismissed. The retailer also hit back at suggestions it has staff league tables. The company uses "an anonymous ranking system to monitor performance", it said. A staff number known only to the employment agencies, the company and the worker "benchmarks staff against the anonymised data of their peers" and workers can check their performance "should they wish to do so", it added. Earlier this week, Business Minister Nick Boles suggested the tax office could take enforcement action if a company was paying less than the minimum wage. Mr Boles said HM Revenue and Customs "will be listening to this debate". He was responding to a question from Labour MP Chuka Umunna, who said the company was a "bad advert for British business". Unite regional officer Luke Primarolo said the union looked forward "to participating fully with Mike Ashley's review". "Unite has repeatedly raised concerns with the board and Mike Ashley directly about the use of Victorian work practices," he said. Q&A: What are zero-hours contracts?